Many business owners strive to put their best foot forward in how their clients and customers perceive their business. But, there is one area that many fall short—the cleanliness of their restrooms. Many business owners do not put this area at the top of their list when in actuality they should. To make this area less daunting, the creation of a commercial restroom cleaning checklist is the best asset a business can have and utilize. The commercial cleaning checklist can be as unique as the business it is designed for. This is a checklist specifically for your janitorial services, and as such may contain those tasks you feel need to be done. The tasks can be listed as needed on a daily, weekly or even monthly basis—it is up to you. Whatever you decide to include, you need to make sure you spell out your needs and have them planned out so that the areas will be taken care of in a quick, and efficient manner. Once you have your plan and your checklist, you need to make sure your cleaning staff is properly trained. For instance, most individuals are not aware of the different protocols involved in cleaning and sanitizing. Cleaning simply removes the surface dirt and grime, whereas sanitizing is a deeper cleaning that attacks both germs and viruses on their own turf. It is also suggested that your staff understands the checklist needs to be followed very strictly. 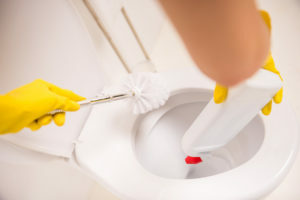 Once the first deep cleaning is done, it will then be a matter of following the checklist to maintain a properly cleaned restroom. Finally, diligence is key in this endeavor. If your staff does not follow the checklist and make sure to follow all protocols for the areas that need cleaning, then the checklist will be of no use. Make sure your staff understands the needs the checklist details, and ask if they have any questions or need any further clarification. Also, keep in mind that delegating your janitorial services to your current staff may not be in your company’s best interests. Many studies have shown that this can cause a significant drop in both morale and productivity. In this case, you may be better off considering farming your needs out to a commercial cleaning service.